My 1-2-3 Cents : Raw Memories: #7 Vince Goes Boom! Wrestling is a soap opera for me. How many times have you heard that expression? It really is true though. In addition to the struggles between wrestlers, there are love angles and sometimes a character on screen says goodbye forever. That was the case (or so we thought) for Mr. McMahon back in June 2007. I was on vacation in Mexico the night the angle originally aired. I watched from my laptop the next day as WWE.com broadcast the highlights. The night was set to be "Mr. McMahon Appreciation Night", but no one expressed any love for the CEO. In fact, stars put the boss down, which lead to Vince cracking under the stress of the job and the lack of appreciation from his employees. In a stoic moment, he walked through the back locker room, focused on getting out of the building. Superstars watched in awe (and Paul London laughing) as the chairman left. He made it outside, reached for the handle of his white limo and stepped inside. 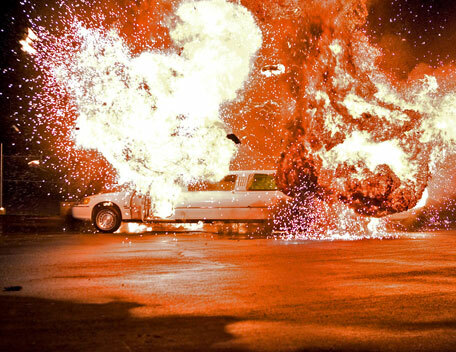 Moments later, BBBOOOOMMMMM, the limo lit up the night sky as it exploded right there. Raw went off the air with the world assuming the boss was dead. It did lead to a lot of speculation as to what happened to McMahon. The main stream media picked up on it. But the events that happened a few weeks later put an end to the storyline. In real life, Chris Benoit murdered his wife Nancy and their son Daniel and then took his own life. The next night, Raw opened on Vince in the middle of the ring in an empty arena and broke the news. The show turned into a tribute to Benoit and his family as no one knew at that time that the three died at the hands of Chris himself. That night was supposed to be the memorial service for Vince. Eventually the storyline got reworked and it was made that Vince had faked his own death. This lead us to the "Vince, you are Hornswoggle's father (just kidding)" angle too. 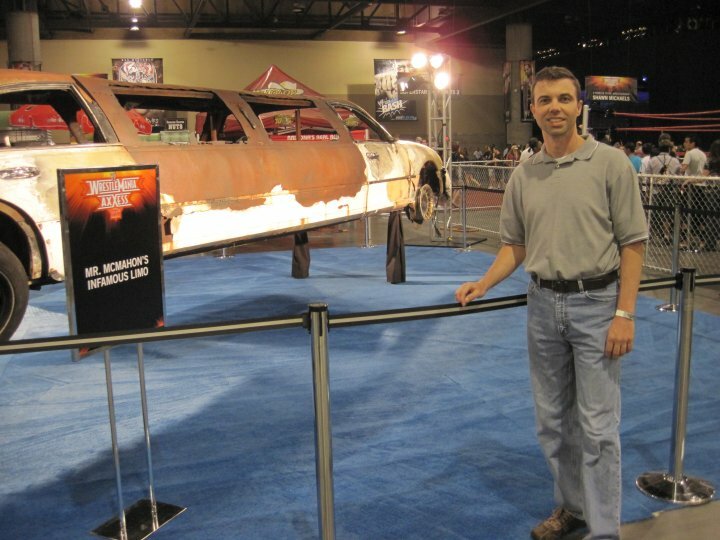 A few years ago at Wrestlemania Axxess I got to pose for a pic near the charred remains of the limo. It was pretty cool to see it up close. Honorable Mention: Yesterday my favorite memory was the beer bath by Stone Cold. 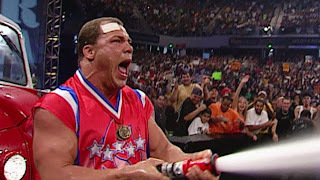 Today's honorable mention is the milk truck incident with Kurt Angle. It's similar to Austin's soaking of the Corporation in 1999. Angle, fed up with the Alliance and Steve Austin decided to interrupt Stone Cold Appreciation Night with milk truck. It all ends with Angle slamming a couple of milks just like Austin does with his "Steveweisers" I'm typically not a fan of recreating or trying to do the same angle twice, but I really felt like everyone involved did a great job with this and created a great Raw memory. Kudos to JR for putting his heart and soul into telling that story too. You'll hear another memory where JR really paints the picture in the coming days.